← Relationship Bliss or Amiss? All peace lies within the moment, within the “now”, peace of mind, peace of soul, peace in being, none of it exists in the past or the future, peace within can only exist right now and right now is what’s most important. It’s the only thing we have power over. 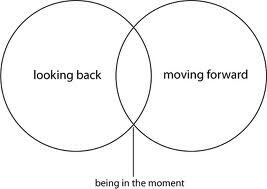 Being present is choosing to exist in that particular time frame, the timeframe of the present. It’s a choice (choice: the most incredible gift us humans have the power to control and exercise and we don’t use it wisely enough). You can choose to focus on any three of those time frames at any given moment. In order to know which time frame you’re in you then have to be in a heightened sense of, or awareness around, your thoughts and we all know our thoughts become our words and our actions. Once you are aware of your thoughts you can then begin to take notice of which time frame you are in when in those thoughts. Are you judging and comparing your past and your future based thoughts on your present moment? The past is full of what we think “should” be happening. Our mind movie plays out to what the future “should” look like, and then judgment sets in around ourselves and others. Our thoughts are handicapped with analyzing the past and our expectations of the future and cripples the ability to be present and we miss out on the party. Walk into your kitchen and stand over your trash bin, now take the word “should” completely out of your vocabulary and dump it in the garbage. It’s a useless word. What it does is stops you from being authentically you. It hides you from yourself and the world. It seems like a safe place to be, but in fact it’s quite damaging and cuts off your circulation, you can’t breath in the “should”. What’s so amazing about the present is the power that only the present has (not the past, not the future) is that in the present we can take those crippling thoughts, acknowledge them, become aware of them, and then redirect them on their way without cultivating them or hanging onto them. We have no power over the past, it’s done. We have no power over the future (unless you’re Marty McFly). The only power we have is in the present where we can we allow all three-time frames to exist in harmony, if we choose. Think of the kitchen at a house party, people flow in and out of the kitchen, a few stay there most of the night and the next day everyone says, “the kitchen is where the party was”. What it doesn’t mean is hanging on (there it is again! Letting go!). Change happens moment to moment. No two moments are the same. It takes an instant to become present, and it takes an instant to come out of the moment. Most of us fear change, so being present is scary. Practicing being in the moment is also practicing trust in change. Change is the essence of life and we have to trust life. Do you know that most people spend less than 1% of their time being fully present? That’s not nearly enough time, imagine how much happier we’d all be if we spent more time in the moment. We’d catch so much more of life. And happiness is contagious, it’s the one contagious thing I’d love to catch! When you start becoming more aware of your thoughts and what time frame they exist in, you can then take notice to when and if you are trying to alter the present moment and do something about it, you can exercise your right to choose. We hear the term being present all the time now, and we hear a lot about people practicing being in the moment, but what does it really mean? “The experience of presence is a central aspect of human psychological health and maturity. It is the capacity to be fully present to what is happening within, and around, oneself in the present moment and not be drawn into distractions, reactions, projections, or defenses. It enables us to respond rather than react. In common parlance presence is often described as “being centered”. Here is what is really groovy about being present. WE CAN ALL DO IT. Everyone. It takes practice, like anything else, but it’s available to everyone on the planet. I’ve mentioned that I’ve been really good at training my muscles to compete in various sporting challenges. Well, being present is also something that one can train towards and I’ve been putting it into practice, slowing letting it develop into a habit. I’ve always been one to push forward, always planning my next move. By bringing myself back into the now, I’ve learnt so much more about myself, my people, my environment. And I’m happier. I’m calm. There is peace. You won’t sweat the small stuff. Less worry. You’ll notice the energy in your world and the people in it to be much more positive. You’ll be more positive and clear. Your memory will improve. Truly. Don’t try to quite your mind, it’s about balance, harmony and flow. You are not just your thoughts. You are the force of them and what moves though your mind, you direct them. Be Mindful. Aware of your thoughts and where you are in them. Most importantly, presence makes us aware and accountable. Imagine a world full of awareness and accountability? Oh the possibilities. Life is a sequence of moments called now and there is no better time to become present than in this second and there is no better place to start than right here.